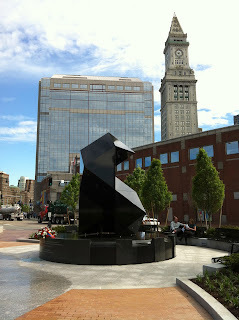 The new Immigration Armenian Genocide Monument just completed. The true story behind the this monument. Even Mount Ararat, the ancestral homeland and pride of the Armenian people, now lies within Turkey’s borders. A few weeks ago, a Turkish tourism advertisement prominently featuring Mount Ararat with a depiction of Noah’s Ark. Of course, there was no mention of the Armenians, believed to be the descendants of Noah’s son, Japheth. This beautiful well designed memorial incorporating , landscape design with greenery,a sculpture and a working water fountain is now a Boston treasure. "Boston Bronze and Stone Speak To Us" would be honored to include this meaningful monument for all people within our second edition soon to be printed.